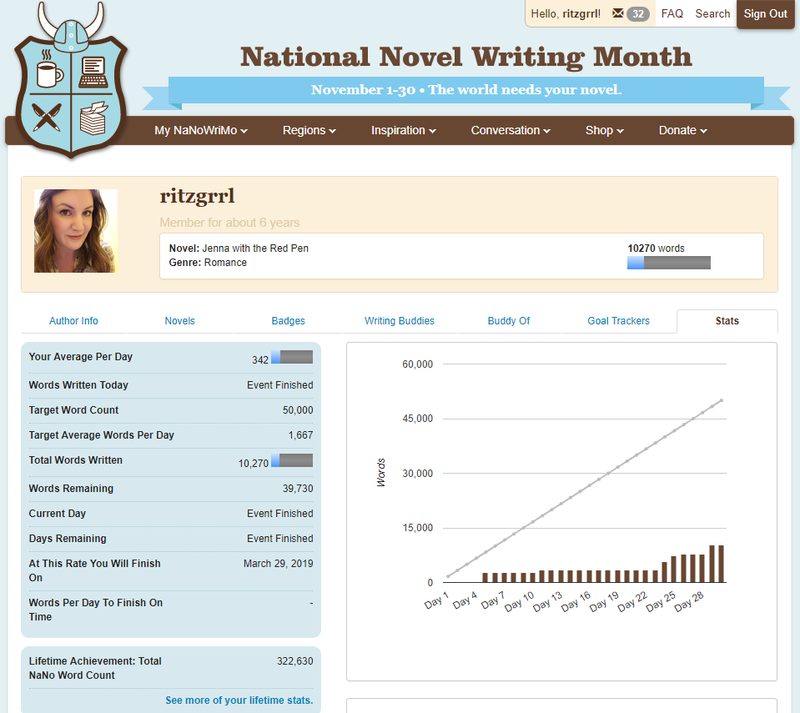 This was my seventh year participating in NaNoWriMo and my first year not completing it. And I’m working on being OK with that. November’s been my favorite month of the year since 2012, thanks to NaNoWriMo, but it wasn’t this year. I don’t have any real excuses for not finishing. I had plenty of time. It’s not like there were fewer hours this November than the last six, and I didn’t have any more plans than I usually do. In fact, I probably had less. It was completely a mindset thing this year. I’m trying not to be resentful about parts of it, which is the purpose for this post. My own personal pep talk. I was distracted, and I chose to work on other aspects of me. Some of it was an emotional state that wasn’t conducive to writing romance, but I probably could’ve gotten past that too had I focused. Maybe. Instead, I spent more time with my husband and kids instead of saying, “Sorry, guys! You know it’s November! See you in 30 days!” So it wasn’t all bad. It wasn’t like I wrote nothing though. I managed to cobble together 10,000 words, bringing the draft of my third Rockin’ Austen book to 28,000. So I’m halfway done with that when my original goal was to have the draft finished by now. In fact, a lot of things didn’t go as planned for this book series so far. For example, I rushed the release of the Pink Hair e-book when I should’ve waited and lined more things up first. Story of almost every self-pubbed author’s life, right? Except that I knew better this time, and I had a(n) (admittedly half-baked) plan in place. But it’s fine. I’ll figure it out. I say that a lot, usually when I get myself in a bind that I have to dig myself out of (to mix metaphors). Although I’m not always very convincing when I say it, I mean it this time. Right? Right. Having readers in the US, Canada, the UK, Australia, and Germany. And those are only the places I know of for sure! And you shouldn’t diminish your accomplishments either. Brag a little today! I know I do. Ask my coworkers (haha). So what’s my plan going forward? OK, I haven’t figured that out yet, but I will.